Recceived for publication: 18 May, 2009. Accepted for publication: 2 June, 2011. 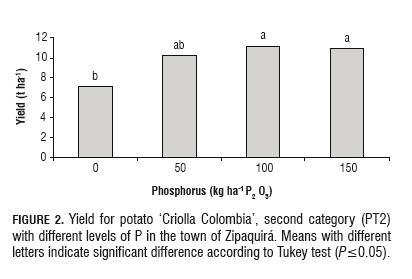 In the locations of Zipaquirá and Cogua located in the department of Cundinamarca, the effects of applying different levels of phosphorus and potassium on tuber yield and specific gravity in the diploid potato variety Criolla Colombia were evaluated. The design used a completely randomized block with three replications and a 4 x 4 factorial structure, where the first factor corresponds to phosphorus (0, 50, 100 and 150 kg ha-1 P2O5), and the second, potassium (0, 50, 100 and 150 kg K2O ha-1). The variables evaluated were specific gravity and tuber yield in the categories: first (PT1), second (PT2), third (PT3) and total (PTT). 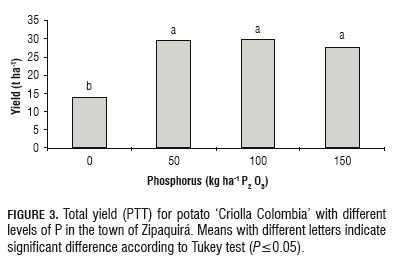 In Zipaquirá, there were differences in the phosphorus factor for the yield variables PT1, PT2 and PTT, while in the town of Cogua, the only difference for this factor was found in the variable PTT. In these variables, the levels of 50, 100 and 150 kg ha-1 of P2O5 produced higher yields that were equal and above that of the 0 kg ha-1 P2O5 level. 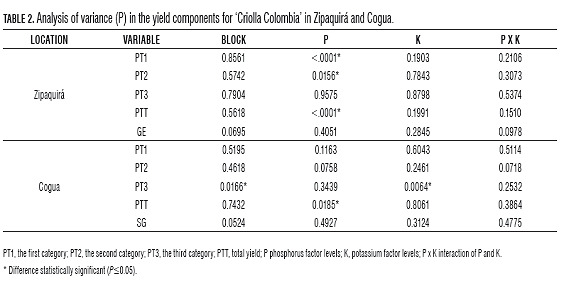 In the potassium factor, differences were found only for the yield variable PT3 in the town of Cogua. The specific gravity did not respond to the P or K factors evaluated. Key words: fertilization, specific gravity, Solanum phureja, diploid potato. En las localidades de Zipaquirá y Cogua de departamento de Cundinamarca, se evaluó el efecto de aplicación de diferentes niveles de fósforo y potasio sobre el rendimiento de tubérculo y la gravedad específica en la variedad de papa diploide Criolla Colombia. Se utilizó el diseño de bloques completamente al azar con tres repeticiones y estructura factorial 4 x 4, donde el primer factor corresponde a fósforo (0, 50, 100 y 150 kg ha-1 de P2O5), y el segundo, potasio (0, 50, 100 y 150 kg ha-1 de K2O). Las variables evaluadas fueron gravedad específica y rendimiento de tubérculo en las categorías primera (PT1), segunda (PT2), tercera (PT3) y total (PTT). En Zipaquirá se encontró diferencias en el factor fósforo para las variables de rendimiento PT1, PT2 y PTT, mientras que en la localidad de Cogua sólo se encontró diferencias en este factor para la variable PTT. En estas variables los niveles 50, 100 y 150 kg ha-1 de P2O5 fueron iguales entre sí y superiores al nivel 0 kg ha-1 de P2O5. En el factor potasio sólo se encontró diferencias para la variable de rendimiento PT3 en la localidad de Cogua. La gravedad específica no presentó respuesta a los factores de P y K evaluados. Palabras clave: fertilización, gravedad específica, Solanum phureja, papa diploide. The species Solanum phureja (2x) Juz. et Buk. is classified within the Solananeae family, genus Solanum, section Petota series Tuberosa, and, together with the species S. tuberosum subsp. andigena, constitutes the diversity of potatoes grown in Colombia (López, 1993). Its name derives from the Aymara word "phureja" meaning early. This diploid has a single branched stem, slightly bright leaves; the tubers have no rest period and have more protein than the tubers of the species S. tuberosum (Luján, 1996). Its center of diversity is located in the department of Nariño, in southern Colombia, to the north of Ecuador. In addition, the widely used taxonomic classification of Hawkes (1990) recognizes it as one of seven cultivated species (Solanum phureja with three subspecies); Huaman and Spooner (2002), based on a study of morphological characters, designated it as Group Phureja within a simple designation of the Solanum tuberosum class. Spooner et al. (2007), with data from molecular studies, suggested that S. phureja remain included within the classification of Solanum tuberosum Group Andigenum. The species S. phureja is a genetic resource of national importance because its diverse genotypes have been identified with high protein content (Rodríguez et al., 2006), and because of its sources of resistance to Phytophthora infestans (Estrada, 2000) and PYVV (Vargas, 2010), pleasant flavor and texture, easy preparation, good acceptance in the market and high export potential in various forms of processing (Rivera et al., 2006). The criolla potato is produced in different regions of Colombia, mainly in the valleys. Its quality depends on the microclimate, altitude, solar radiation and humidity during the production cycle (Carmona et al., 1998). Despite its phenotypic heterogeneity, in Colombia, a small fraction of the criolla potato is processed into a precooked-frozen or pickled form for the domestic or export market (Rodríguez et al., 2009). According to the first national census of the potato crop conducted by DANE in Cundinimarca in the agricultural year 2001-2002, the criolla potato ranked third in harvest area after the varieties Parda Pastusa and Diacol Capiro with an average yield of 15.3 t ha-1 (Fedepapa, 2003). Colombia is the largest producer, consumer and exporter of diploid potatoes in the world, with the competitive advantages of being a center of diversity and having wide consumer acceptance due to its organoleptic characteristics (Rodríguez et al., 2009). To exploit the genetic potential of crops, the optimum levels of potassium, nitrogen and phosphorus are required to achieve better quality and yield of the tuber. After nitrogen, phosphorus is the element that is most often limited in soils. It is absorbed primarily as the monovalent phosphate anion (H2PO4-) and less rapidly as the divalent anion (H2PO42-). Soil pH controls the relative abundance of these two forms (H2PO4- is favored at a pH below 7 and H2PO42- above). Much of the phosphate is converted into organic forms as it enters the root or after it is transported through the xylem to the stem or leaves. Phosphorus is never reduced in plants, where it remains as phosphate, either free or bound in organic forms such as esters (Salisbury and Ross, 1994). Phosphorus performs functions in plants, such as a structural element forming part of the macromolecular structures such as nucleic acids (RNA and DNA) and in the phospholipids of cell membranes. It also has an important function in energy transfer such as in the esters of energyrich phosphate present in the metabolic mechanisms of the cells, within which ATP participates in the main metabolic processes such as photosynthesis and respiration. Optimum plant growth is accompanied by a demand for P to meet the demands for the functions described above (Marschner, 2002) and so depends on the availability of P in the soil, and the ability of the plant to absorb P in the soil (Álvarez-Sánchez et al., 1999). Many factors influence the supply of P to plants. Among the most important are the availability of P in the soil, temperature, root density and root efficiency in P uptake (Pessarakli, 2001). Potato fertilization usually requires high amounts of phosphate fertilizer (60 to 80 kg ha-1 P) to achieve economically acceptable yields, necessitated by the low root density of this plant (Álvarez-Sánchez et al., 1999) and because P diffusion moves very slowly in soil, which causes difficulties in P absorption by the plant (Barber, 1994). Young plants with a P deficiency are bluish green in color in the early stages of growth. Older leaves with deficiency symptoms usually appear dark green (Mengel et al., 2001). Phosphorus deficiency in the potato slows apical growth, resulting in small, rigid plants; reduces the formation of starch in the tubers causing necrotic spots distributed in the tuber (Pumisacho and Sherwood, 2002); decreases CO2 absorption capacity of leaf photosynthesis; results in an inadequate supply of phosphates which prevents the export of triose phosphate from the chloroplast, and therefore, affects the synthesis of sucrose (Mengel et al., 2001), and causes delayed development of the tubers (McCollum, 1978). In a soil clay-sandy with medium to high concentrations of P, the effects of different doses of fertilizer and sources of P on the variety Russet Burbank were analyzed. The numbers and yield of small tubers increased as the dose of P was increased, indicating that P may play an important role in regulating the number of tubers per plant (Rosen and Bierman, 2008). In soil of Turkey, poor in organic matter, slightly alkaline, with moderate levels of P and high levels of K, three doses of N with three doses of P (0, 90 and 180 kg ha-1) with the Agria variety were evaluated. In this study, an effect of phosphorus levels on the oil content in fried potato chips was observed, lessening as the dose of P increased. Doses had no effect on dry matter, starch content or protein content. In studies conducted in different localities with the variety Diacol Capiro in Colombia, a response to P fertilization up to the level of 200 kg ha-1 has been reported; no response was reported in the variable specific gravity (Ñústez et al., 2006). The potato (Solanum tuberosum) has a relatively high potassium requirement (K), which has led to the suggestion that high doses of the element are needed for potato production (Panique et al., 1997). Potassium is a monovalent cation and its capture is highly selective; is coupled with metabolic activity. It is characterized by high mobility in plants at all levels; is the most abundant cation in the cytoplasm and along with its accompanying anions makes a high contribution to the osmotic potential of cells and tissues. This element has an important role in water relations of the plant, furthermore K is not metabolized and forms easily interchangeable weak complexes (Marschner, 2002). It stimulates the activity of the enzyme associated with starch synthesis (starch synthase) (Mengel and Kirkby, 1987), in addition, it facilitates the translocation of assimilates to the tubers, which ultimately increases the bulking capacity of the tuber and its biomass. Potassium deficiency can result in a decrease in yield and tuber size McDole et al. (1978). Some quality factors such as dry tuber, specific gravity, sugar content, flesh color and hollow heart are affected by K fertilization (Chapman et al., 1992). Numerous studies have reported reduction in specific gravity or dry matter content by the increasing application of potassium (Laboski and Kelling, 2007). Soils deficient in this element reportedly increase the specific gravity of tubers (Chapman et al., 1992). Davenport and Bentley (2001) concluded that the source of K does not affect the specific gravity of the tuber. Contrary results were reported in a later study by Kumar et al. (2007) with varieties of India where the specific gravity and dry matter were higher with a sulfate and nitrate source than a chloride source, while the quality of processing, tuber yield and biomass were similar for the chloride and sulfate sources but lower for the nitrate source. According to the ICA (1992), critical levels of available P for potato determined by the Bray II method for the Cundiboyacense plateaus are: a) low below 40 mg kg-1, b) medium between 40 and 60 mg kg-1 and c) high over 60 mg kg-1. Critical levels of K in the Cundiboyacense plateaus are: a) low under 0.30 cmol kg-1, b) medium: between 0.30 and 0.60 cmol kg-1 and c) high: over 0.60 cmol kg-1 (ICA, 1992). The above critical levels were determined for Solanum tuberosum subsp. andigena, no guide exists for the diploid varieties of S. phureja. The fertilizer use in criolla potato cultivation in the cundiboyacense plateaus during semester A-2007 accounted for 37.7% of the total input costs, 16.9% of the direct costs and 13.7% of the total costs of the crop (Villarreal et al., 2007). Its high production costs necessitate the need for research in the area of crop nutrition and fertilization, to determine the needs of the different varieties and different growing areas, and thus find a more efficient production system. In Colombia, research on the species Solanum phureja has been carried out, however very few are related to the area of plant nutrition, so, little is known about its fertilization needs. Pérez et al. (2008) reported for the Criolla Colombia variety that fertilization without N-P-K-Mg fractionation favored foliar development and yield potential, in addition, the application of boron is found to invoke positive responses in tuber yield. Arias et al. (1996) evaluated the performance of the criolla potato under different planting densities on the Bogota Plateau, in the Centro Agropecuario Marengo -CAM (Mosquera, Colombia at 2,570 m a.s.l.) in a soil with high levels of P and K, using a fertilizer with a 13-26-6 compound in doses of 500 kg ha-1 (130 kg ha-1 of P2O5 and 30 kg ha-1 K2O). The study reported yields of 6.8 t ha-1 in the first category, 3.5 t ha-1 in the second category, 2.5 t ha-1 in the third category and 12.5 t ha-1 in overall yield. The objective of this study was to evaluate the effects of applying different levels of phosphorus and potassium on tuber yield and specific gravity on the local variety Criolla Colombia (Solanum phureja Juz et. Buk). The present study was carried out at two localities in the department of Cundinamarca, the first in the town of Zipaquira (2,590 m a.s.l.) and the second in the municipality of Cogua (2,690 m a.s.l. ); the soil analysis of these two locations is shown in Tab.1. The tests were carried out in the second half of 2004. The locations of the evaluations were in the municipalities of Cogua and Zipaquirá which belong to the Sabana Centro area in the department of Cundinamarca, characterized by a cold semi-humid climate (dry forest, low mountain), an average temperature range of between 12 and 18°C and an average annual rainfall of between 500 to 1,000 mm with a similar historic distribution in the first and second halves of the year (SADC, 2008). The experiment was performed using a completely randomized block design with three replications and a structural factorial of 4x4. The first factor corresponds to phosphorus (0, 50, 100 and 150 kg ha-1 of P2O5) and the second to potassium (0, 50, 100 and 150 kg K2O ha-1). The experimental unit was 32 m2, with row spacing of 0.8 m and 0.30 m between sites. The sources of fertilizers used were urea, triple superphosphate and potassium sulphate. Tuber yield: The tubers were classified into three categories according to the diameter of the tuber: the first category (PT1:> 4 cm), second (PT2: 2 to 4 cm) and third (PT3: <2cm). At harvest, the tubers were weighed by category and added to obtain the total, this variable was analyzed as t ha-1. Specific Gravity (SG): 10 tubers were sampled per plot from the first category to determine the specific gravity using the method of weight in water (Ww) and weight in air (Wa). The SG was calculated by Talburt and Smith (1975). Statistical analysis was performed using analysis of variance and multiple comparison test of Tukey, using the SAS software version 9.2. At this location, differences were found for the phosphorous factor for the yield variables in the categories: first (PT1), second (PT2) and total (PTT) (Tab.2). No differences were observed for the potassium factor or the phosphorus x potassium interaction for any of the variables evaluated (Tab.2). In the variables PT1, PT2 and PTT, phosphorus levels 50, 100 and 150 kg ha-1 P2O5 produced higher yields that were equal and above that of the level 0 kg P2O5 ha-1 (Figs.1, 2 and 3). Keep in mind that the level of phosphorus found in this location (Zipaquirá) was 14.2 mg kg-1 (Tab.1), which is considered a low level of this element, which would explain the positive response to the application of P levels greater than 0 kg ha-1 P2O5. However, the application of levels greater than 50 kg ha-1 P2O5 did not present differences in tuber production of these yield variables, which can mean that the variety requires a low level of P or is very efficient at taking in the nutrient. There were no differences for the variable specific gravity in any of the factors evaluated or for the potassium x phosphorus interaction (Tab.2). At this site, the values of this variable were between 1.063 and 1.068, relatively low values for the variety, taking into account the reports from Rodríguez et al. (2009) in evaluations in the department of Antioquia. In this location, the level of soil K was 1.16 cmol kg-1, which is high in these soils for potato cultivation in the departments of Cundinamarca and Boyacá (ICA, 1992), this explains the absence of a response to K including up to the level of 150 kg ha-1. Similarly, Becerra et al. (2007) reported that in the local variety Criolla Guaneña, in soil with an average level of K in the municipality of Pasto (Nariño), there was no response to two levels of K (50 and 100 kg ha-1 K2O), and 50 kg ha-1 K2O was enough for proper growth and high yield. The differences found in the phosphorus factor for the variable total tuber yield (PTT) are explained by the difference between the 100 kg ha-1 of P2O5 (34.8 t ha-1) level and the 0 kg ha-1 of P2O5 (26.8 t ha-1) level (Tab.2 and Fig.5). No interaction (P x K) was found for any of the yield variables evaluated (Tab.2). In the potassium factor, the only significant difference in a yield variable found was in the third category (PT3), explained by the difference between the 150 kg ha-1 of K2O (0.72 t ha-1) level and the 0 kg ha-1 of K2O (1.36 t ha-1) level (Tab.2 and Fig.4), this means that without a significantly increased application of K in proportion to the small sized potato, which is generally unfavorable to the farmer, the value and weight of the higher-priced commercial potato will be reduced (PT1 or PT2). On the other hand, if the aim of production is processing (potato for liquor), the absence of K fertilization may be favorable. The variable specific gravity did not respond to the application of P and K, and had no P x K interaction (Tab.2), the range observed for this variable in this locality was between 1.081 and 1.087, higher than observed in Zipaquirá and similar to the reports from Rodríguez et al. (2009) in evaluations of the variety in the department of Antioquia. The level of P in the soil of this town was 23.9 mg kg-1 (a slightly higher value than that found in the town of Zipaquira Tab.1), which is low in soils of Cundinamarca and Boyacá for potato cultivation (Solanum tuberosum subsp. andigena) (ICA, 1992). In the town of Cogua, there was no response to application of P in the yield variables of the categories: first (PT1), second (PT2) and third (PT3) (Tab.2), a result related to the amount of the element in the soil , which for the observed response is sufficient for the variety Criolla Colombia. The results suggest the need for future studies on critical levels of P and K for varieties of Solanum phureja, because the variety Criolla Colombia has shown, similar to the reports of Becerra et al. (2007) for the Guaneña variety, requirements well below those reported for tetraploid potato varieties, which favors the production cost structure for the cultivation of diploid varieties and therefore their competitiveness. In the total yield (PTT) variable, differences were observed for the P factor, that is, the levels 50, 100 and 150 kg ha-1 of P2O5 were equal and above the 0 kg ha-1 P2O5 level, with values higher than 32 t ha-1, well above the average production of six localities for this variety as reported by Rodríguez et al. (2009) in Antioquia (15.62 t ha-1). As in the town of Zipaquira, this variety responded to P application up to 50 kg ha-1 P2O5, but did not differ above this level, which shows a low requirement of this element, or an efficient ability to absorb it, allowing one to gather that, taking into account that this variety is a clonal selection from the native yellow population, it is, no doubt, a natural strategy for survival not known in detail (Fig.5). The soil of this town presented a soil K level of 1.72 cmol kg-1, a high level for the potato (ICA, 1992), this explains the lack of response to K application in the key yield categories, PT1 and PT2 (Tab.2). Similar results were reported by Becerra et al. 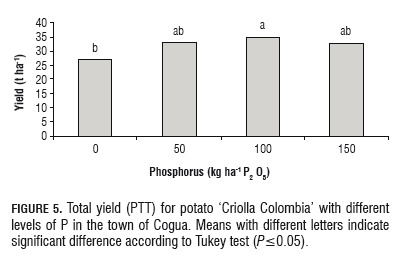 (2007), who found no differences in yield variables or specific gravity for phosphorus or K factors, nor for the interaction between them in 'Criolla Guaneña' grow at two locations in Pasto (Nariño). 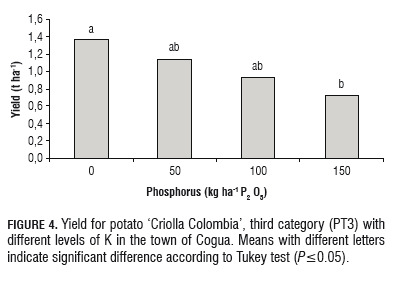 The results of this work with respect to the variable specific gravity are similar to those reported by other research in potato fertilization, in which the absence of a variable response: to the application of increasing levels of P has been noted in the variety Diacol Capiro (Ñústez et al., 2006), at different levels of K in soils of Saudi Arabia in the variety of the subspecies tuberosum (Abdelgadir et al., 2003), at different levels and sources of K in the variety of Washington's Columbia Basin (Davenport and Bentley, 2001). Although the specific gravity did not respond to the application of different levels of K in the towns of Zipaquirá and Cogua for the variety Criolla Colombia, it is important to further studies to determine what level and source of K produces a reduced specific gravity, as reported by studies on S. tuberosum (McDole, 1978; Panique et al., 1997; Kumar et al., 2007). Similarly, the results with respect to tuber yield are in line with those made by Dubetz and Bole (1975) who reported in experiments in Canada that K fertilization did not affect the number or weight of tubers in soils with high K, by Panique et al. (1997) who found no yield response to K application in six of 11 sites tested in Wisconsin, by Davenport and Bentley (2001) at different levels and sources of K in the variety Washington's Columbia Basin, and by Abdelgadir et al. (2003) in soils and varieties of Saudi Arabia. 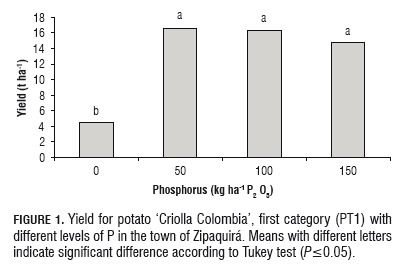 Phosphorus fertilization research on the variety Diacol Capiro conducted in the municipalities of Villapinzón (Cundinamarca) and Toca and Soracá (Boyacá) showed a tuber yield response to the level of 200 kg ha-1 of P2O5 (Ñústez et al., 2006 .) The results of this research show that the variety Criolla Colombia (Solanum phureja) has a P requirement lower than that of the variety Diacol Capiro (Solanum tuberosum), bearing no response above the 50 kg ha-1 P2O5 level, which can be explained by its lower ploidy, reduced cycle time and lower crop yield potential, resulting in lower consumption of this nutrient. The results of this study showed that the variety Criolla Colombia responds to P application, and that yield does not increase with the implementation of levels above 50 kg ha-1 P2O5. In the case of K, this variety did not respond to the application of different levels of this element, however, given the conditions of the locations where the tests were performed, where the level of this element was high, similar studies in soils with low contents of K are recommended, which would allow a better understanding of the fertilization needs of this variety that is highly important to Colombia.